REA Technologies is an industry leader in supporting OEM equipment. We are a premier repair/service provider for industrial and electronic equipment. Since 1999, we have been providing expert service both across the nation and around the globe. Founded by an Electronic Engineer in Western North Carolina, our company has proven that our knowledge and skill are unequalled. Having successfully completed tens of thousands of repairs, you can be assured that we have the experience to get the job done! But don’t take our word for it… you be the judge. Is your plant down? Are you looking for predictive maintenance? Have your needs changed and you need your equipment modified to keep up with production? We can help… and do it at a fraction of the cost of buying new equipment. Our services span from electronic, hydraulic, pneumatic, and robotic repair and maintenance. From repair of drives, motors, and controllers to designing complete production facilities, we have the knowledge and experience to meet the needs of small family owned businesses or multi-million dollar corporations. We are available 24/7 to help you with whatever problems you may be experiencing. We can troubleshoot and repair machines and equipment from the ground up. Our bench technicians are fully capable of repairing board level failures in industrial electronics such as drives, controllers, PLCs, and most other printed circuit boards. Our field technicians are experienced in troubleshooting machine level problems, whether it is isolating bad equipment on the machine, adjusting sensors, or configuring parameters to make it work more efficiently. Our technicians have access to the software to program and troubleshoot the vast majority of industrial electronics. We are familiar with Siemens, Allen Bradley, GE-Fanuc, Automation Direct, and many other brands of automation equipment. We can set up industrial communications networks for DNC, remote call down of part files, RS232 / RS422 / RS485 serial, wired and wireless ethernet for SCADA or HMI applications, as well as inter-node communications between PLCs, drives, controllers, and other devices. 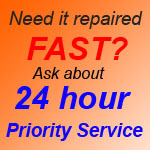 Not only will you get your equipment repaired but you get it with “real” customer service and a 12 month warranty. Our 28,000 sq. ft. main service facility is located in the foothills of beautiful North Carolina. But remember… we can come to you!